JOHN B. COOPER. Autograph Letter Signed, to his wife Mary Cooper. 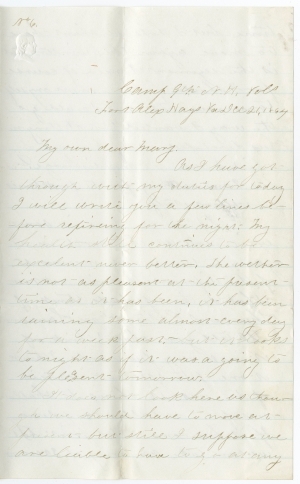 Fort Alexander Hays, VA, December 21, 1864, 3 pp. 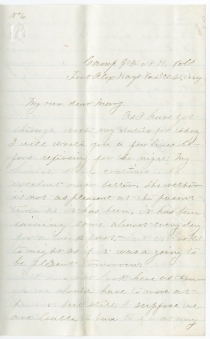 In October 1864, Captain John B. Cooper had written to his wife Mary from the headquarters of the 9th New Hampshire Volunteers near Poplar Grove Church, south of Petersburg, Virginia. He complained that “instead of sending out men or coming themselves,” the people of the North “are sending out foreigners of all nations and I have got heartily disgusted with fighting with such a class of men. One cannot trust them. They will not stand up and fight as men will that came out two and three years ago.” He continued, “We lost two thirds of the men that we went in with on the 30th. I am in command of regiment yet as neither of the field officers have got back, but I wish some of them would come for I have got heartily sick of commanding a regiment when it is on an active campaign.” The battle to which Cooper referred was the Battle of Poplar Springs Church or Peeble’s Farm. The Union hoped to cut the last rail line into Petersburg. Although an initial attack by four divisions captured a Confederate redoubt and a section of trenches, a counterattack orchestrated by Confederate General A. P. Hill prevented the loss of more. The Union suffered 2,800 casualties, including nearly 1,300 captured during the Confederate counterattack. Although the Confederates suffered only 1,300 casualties and retained control of the railroad, those losses were harder to replenish. 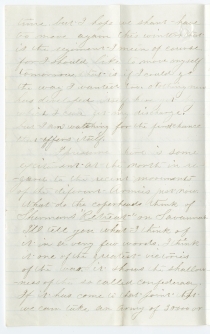 Ten weeks later, in the letter offered here, Cooper is more optimistic about the course of the war, especially the advances made by General William T. Sherman’s army in Georgia, General George H. Thomas’ army in Tennessee, and Generals George Stoneman’s and Stephen G. Burbridge’s raids into western Virginia. He also had high hopes for General Benjamin Butler’s planned assault on Fort Fisher, which guarded Wilmington, North Carolina, the last major port open to the Confederacy. John B. Cooper (1841-1911) was born in New Hampshire, and in 1860, he was a blacksmith in Newport, New Hampshire. He enlisted in Company D of the 1st New Hampshire Volunteers in April 1861. After a brief term of service, he recruited a large number of men at Newport and became their captain as Company K of the 9th New Hampshire Volunteers. He married Mary O. Moody of Newport in August 1862. Wounded at Antietam the following month, he was furloughed but rejoined his company and regiment at Fredericksburg an hour before the charge on Marye’s Heights. He served as provost marshal on General Fry’s staff in Kentucky from February to June 1864, when he rejoined his regiment near Petersburg. After the war, he lived in Newport and served in a variety of local and state offices, and for several years as postmaster of Newport. In 1875-1876, he served as doorkeeper for the New Hampshire House of Representatives. Mary Moody Cooper (1840-1931) married John B. Cooper in August 1862, and they had one son, born in 1867. 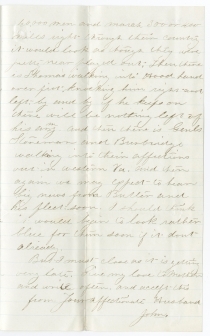 John B. Cooper to Mary Cooper, October 10, 1864, http://www.soldierstudies.org/index.php?action=view_letter& Letter=973.